Demand is growing for gatherings and venues to appeal to all the senses There’s more to an effective meeting than meets the eye. There’s also what meets the ears, nose, fingers, and tongue. And the best way to do that is to take the meeting outdoors. By encouraging attendees to get out of the traditional boardroom, meeting planners can find easy and fun ways to engage their group and create a setting that builds lasting connections among your attendees. 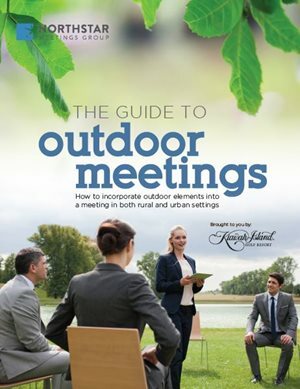 How to incorporate outdoor elements into a meeting in both rural and urban settings. A small change in setting is all it takes for planners to make a big difference for their event. For planners who are hosting full outdoor sessions, it is important to keep a couple things in mind to ensure a successful event. For example, consider a pavilion-type set-up, which provides overhead shade or extended covering that protects from the sun and is adaptable based on weather changes. A casual dress code is also more suitable and comfortable — there is no need to be in a suit when for an outdoor function. Just be careful not to take it too far. 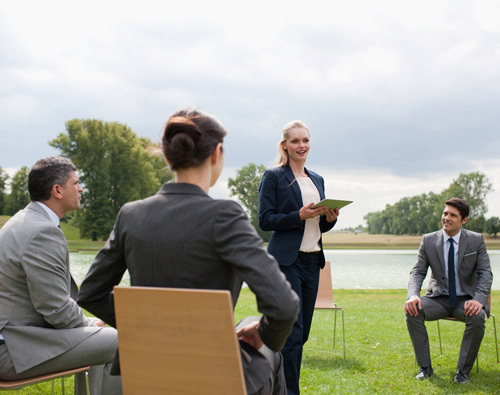 Several types of meeting sessions work well outdoors, such as roundtable discussions that open up dialogue to attendees and encourage “outside of the box” thinking. On the other hand, heavy, content-driven sessions still tend to work best indoors. Even if they have a content-heavy program, planners can incorporate outdoor breaks that allow guests to enjoy the fresh air, give their minds a moment to process all of the information they’ve learned, and give them a chance to “reset” before their next set of sessions for the day.